Equities opened moderately higher, along with a weak VIX (intra low 22.48), but with equities imploding into the weekly close, the VIX soared, settling +8.1% @ 27.01. Across the week, the VIX saw a powerful net gain of 48.3%. Suffice to add... the second consecutive net weekly gain for the VIX, with the highest close since late September. The weekly cycle is offering 28/29 for the Monday open. In theory, the 32/33s would be likely if the sp' lost the 1900 threshold. VIX 40/50s are unlikely in the current down wave, but they do look due in the months ahead, as the sp' looks headed for the 1600s. US equities closed lower for the fourth of five days this week, sp -21pts @ 1922 (intra range 1960/18). The two leaders - Trans/R2K, settled lower by -0.7% and -1.7% respectively. Near term outlook offers serious threat of a Monday gap lower <1900.. but with increasing threat of a short term floor. *closing hour action: TRAINWRECK, an absolute classic instance of the 'rats selling into the weekend'. .. and that.. dear readers.. is how you start a trading year. One hell of a week... confirming what we saw for the December/yearly close. 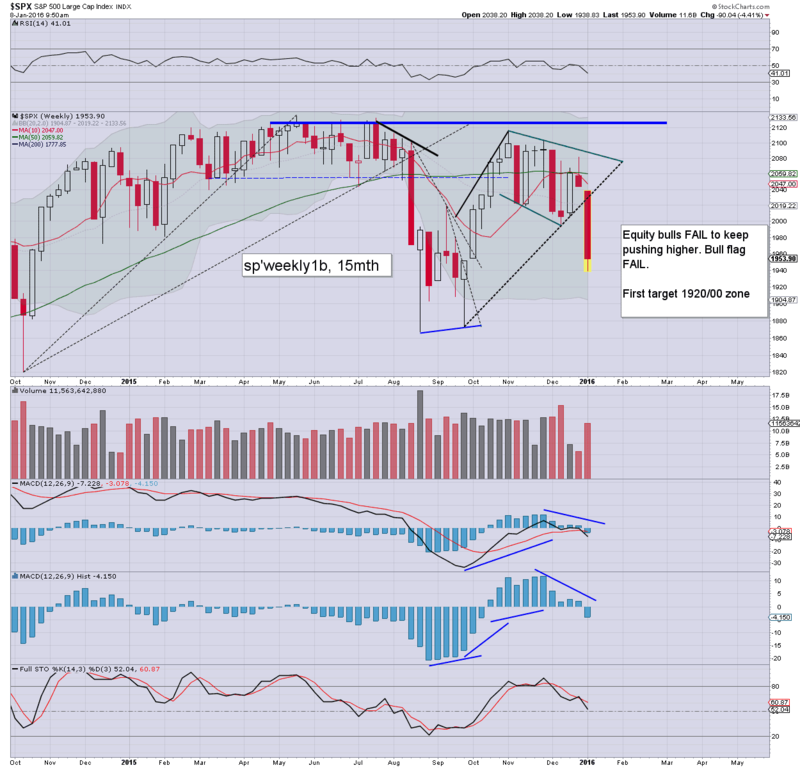 The market is headed broadly lower in the weeks and months ahead.. probably to the sp'1600s or so. US equities are seeing renewed weakness, and we're likely to see a classic instance of 'rats selling into the weekend', as there is high threat of a significant gap lower next Monday. Regardless of the exact close, it has been a powerful week for the equity bears, with a net weekly decline of around -5.0%. Suffice to say... its been one hell of a busy week. The last two days of December were rather definitive - as I noted last weekend. We've now seen FULL clarification of where we're headed in the weeks.. and months ahead. The default trade is clearly to the short side. I realise some will try to trade the rallies, but to me, that seems overly risky and frankly... difficult. *I intend to hold a small TVIX-long position across the weekend, seeking an exit in the sp'1920/00 zone.. along with VIX somewhat higher.. pref' around 28/30. 3.09pm... VIX -1% @ 24.75.... the 25s look due.... weekly cycle is offering 27/28 next Monday.. and that should equate to sp'1920/00 zone. 3.14pm.. Its getting real shaky out there.. Watching Steve Grasso on CNBC.... one of the more bearish guests... noting empty air from 1930-1867... and under 1867.. its a long way down (as in 1600/1500s.. 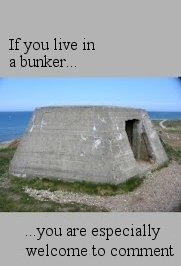 I'd imagine). So.. err.. where is Gartman on a Friday afternoon? 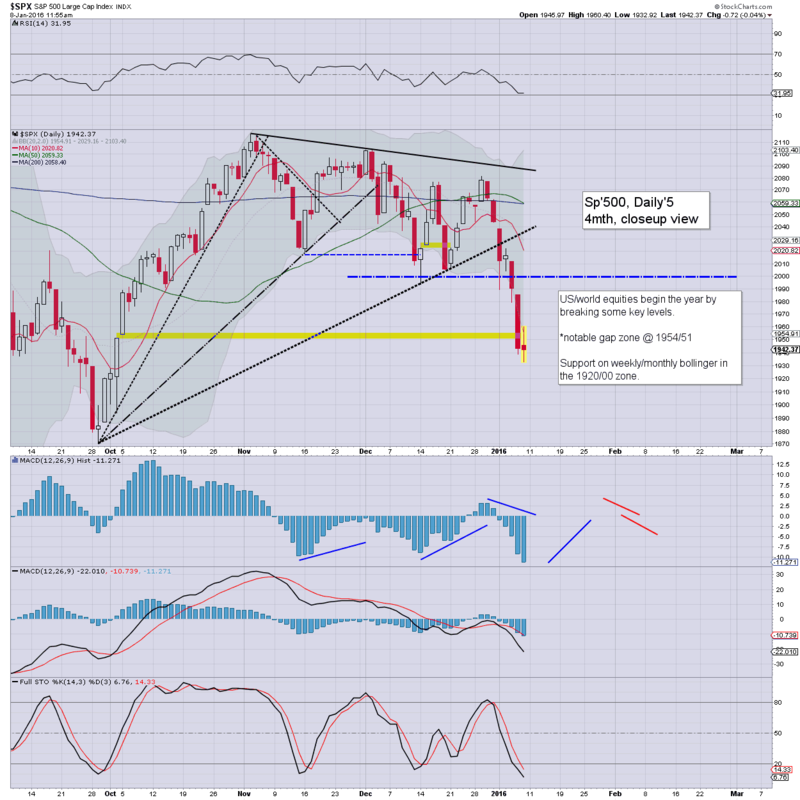 3.25pm.. Market looks due to fall into the sp'1920s... VIX might even break the 26s by the AH close of 4.15pm. 3.30pm.. sp' 1931.... the 1920s are imminent. VIX showing some upside kick... 25.28..... 26s well within range now. 3.33pm.. The rats ARE selling into the weekend ! 3.36pm.. sp'1927... as price action is getting increasingly unstable. This is exactly the style of price action that is necessary for a chance at a giant Monday gap down. We should know around 3.55pm.. if there is a realistic chance. 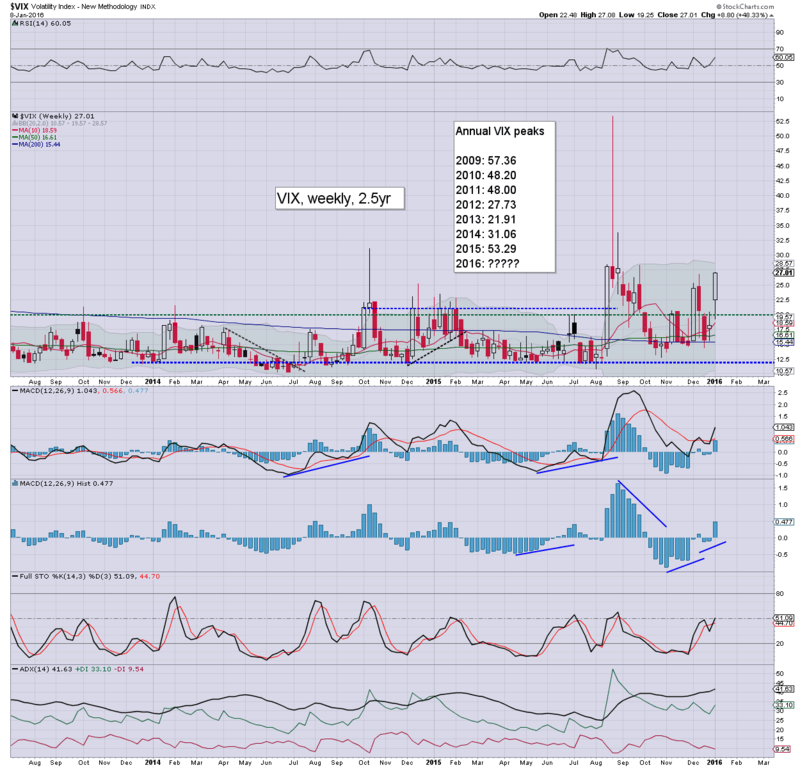 3.43pm... VIX pushing for a new intra-week high (25.86).... 26s look imminent. 3.47pm. 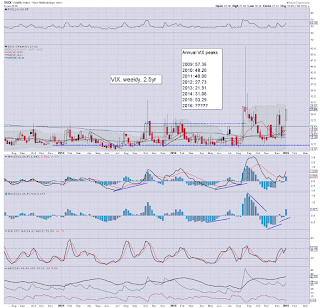 NEW weekly high for the VIX.... next target remains 28/30 zone on Monday. 3.51pm.. TRAINWRECK closing hour.... not quite apocalypse style... but... the setup for next Monday is bearish... with threat of sub 1900 open. 3.55pm...PRICE ACTION does offer a Monday mini-crash. ................ back at the close. 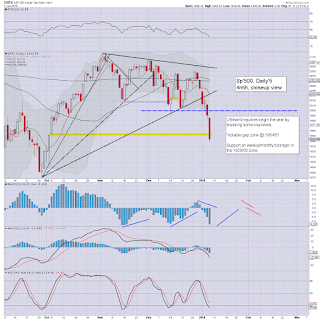 US equities remain in minor chop mode, with the sp' trading around 1940, along with VIX 24/23s. Considering the failure of the pre-market gains, and the declines this week, renewed weakness into the close looks probable. Metals are broadly weak, Gold -$10, with Silver -2.5%. Oil is -0.7% in the $33s. A lot of chop, and considering the good jobs data, the market is simply unable to muster any sustained buying at these levels. We're still on track for the 1920/00 zone, but that clearly looks out of range until next Monday. Indeed, consensus is for a turn early next week.. with first chance of sustained upside. 2.28pm.. the market is seeing renewed weakness again. A break <1930 looks very viable... and that'll give a fair few of the cheerleaders on mainstream TV a good scare. After all, the jobs data was okay.. how could the market be falling still ? A case of 'rats selling into the weekend' looks underway. The market has seen a minor rally from the morning low of sp'1932, back into the 1940s, but still.. we're net lower on the week by around -5%. 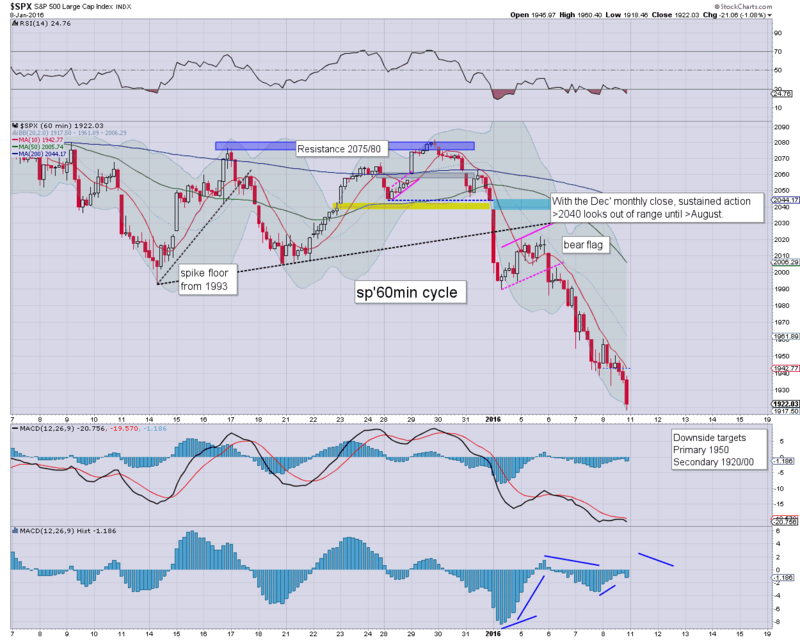 As things are, there is no sign of any real bullish capitulation, and the 1920/00 zone remains due. As things are, a break <1900 looks increasingly out of range in the current cycle. 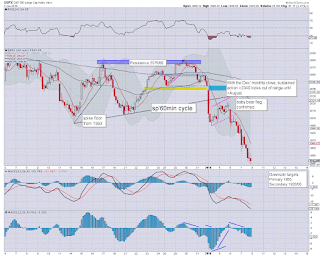 Target for next Mon/Tuesday remains 1920/00 zone.. and from there, best guess is a rally of 3-4%. Sustained action >2000 looks unlikely. On no realistic scenario does a break back above 2040 look possible until the late summer. 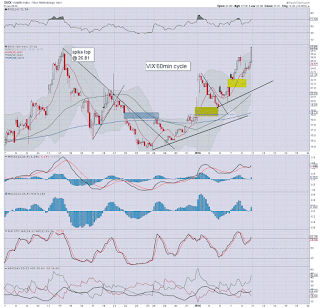 *yes, I'm still long TVIX, will hold across weekend, and look to drop next Mon/Tuesday, preferably with VIX 28/30. 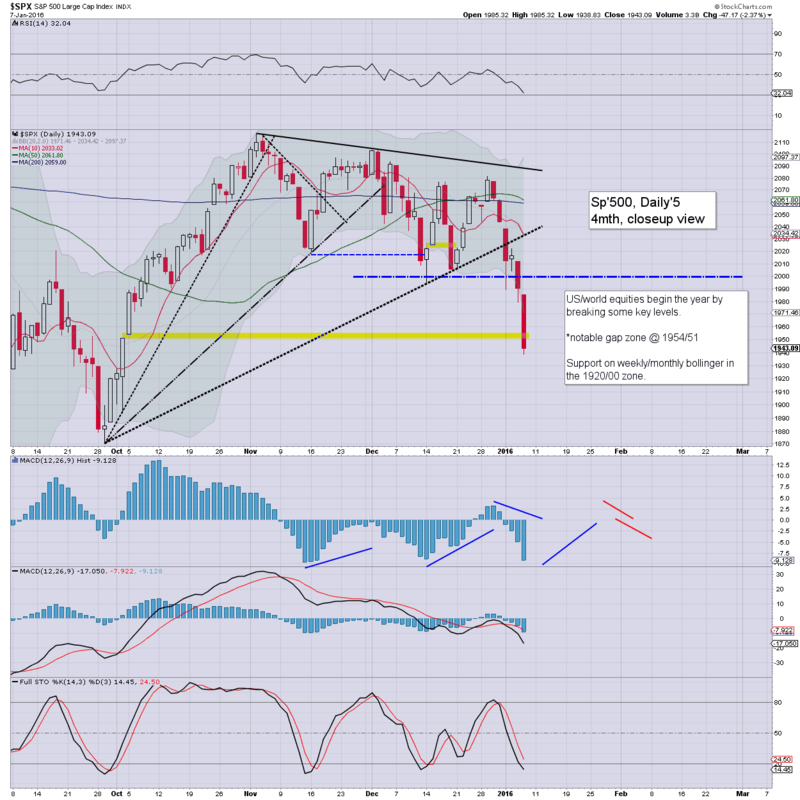 The equity gains were clearly shaky from the open, and we have already seen indexes turn negative, with a new cycle low of sp'1932. 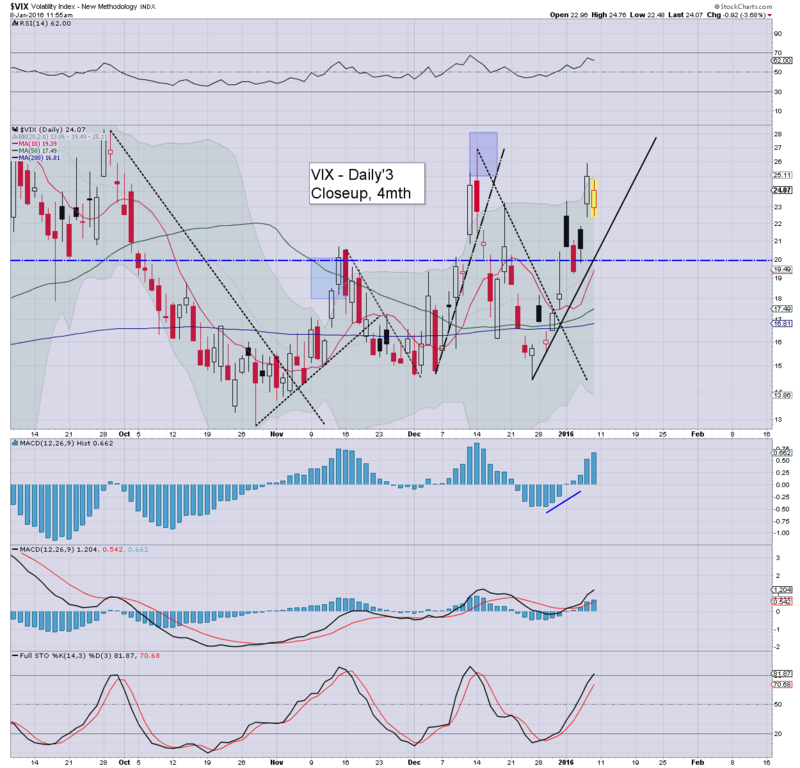 VIX is battling to turn positive, currently in the low 24s. Metals are weak, Gold -$5. Oil is struggling, -0.9% around the $33.00 threshold. *I'm trying not to get lost in the minor noise, as the bigger daily, weekly, and monthly cycles are absolutely clear of where we are headed into the spring/early summer. Price action is similarly clear... rallies ARE being sold into. Not much else to add. The closing hour will be rather important... and regardless of the exact close, we're still set for net weekly declines of around -5%.. which is a massive achievement for the equity bears to begin the year. US equities are clearly struggling, as the underlying weakness - that began from Tue' Dec'29th (sp'2081) remains. The bigger weekly/monthly cycles are quite clear, we're headed broadly lower. 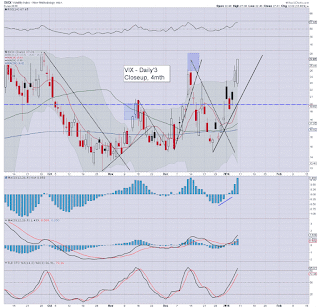 VIX is battling upward from an opening low of 22.48. Oil is back on the slide, -0.6% in the low $33s. *note the opening VIX candle.. of the red reversal doji type, at the top of yesterdays price gap. A break above the Dec' 14th high of 26.81 won't be easy, and it would seem might need <1900. So.. we were higher by almost 30pts in pre-market to around 1975... but we're now almost flat... and the threat of renewed weakness into the weekend is very high. It should be clear, rallies ARE being sold into. Meanwhile... here in London city..
11.29am.. New cycle low.... as the selling resumes. Interesting day.. with a swing from pre-market 1975 (approx) to 1937.. almost a full 2%. A weekly close <1920 would make things real interesting. 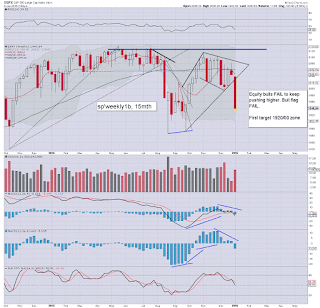 US equities open higher, but any sustained action >sp'1975 looks overly difficult. The Thurs' low of 1938 makes little sense as a key low, renewed weakness to the 1920/00 zone still looks probable. What really matters (for the Monday open) is the style of price action in the closing hour. *anyone getting overly bullish needs to go stare at the weekly/monthly charts for a good few hours. There is nothing to be bullish about.. with the bulls having failed to break a new high, having seen a complete fail of what was a bull flag. So... we're higher, but the gains sure look shaky, and highly vulnerable into the weekly close. Long day ahead.... and most should recognise this is one of many rallies that merit shorting. time for some sun... back at 11am. Good morning. US equity futures are moderately higher, sp +12pts (ahead of the jobs data), we're set to open at 1955. USD is on the rise, +0.5% in the DXY 98.70s. Gold is cooling, -$8. Oil is +0.7%. *awaiting the monthly jobs data. So... overnight gains, and no doubt some equity bears are a little spooked. Broadly though, we're set for severe net weekly declines. sp'1938 makes little sense as a key low, and I'd still look for another push lower to the 1920/00 zone... late today/Monday. I hold to the issue in that the style in which we close today should give clarity on whether Monday is down big. By 3.55pm we should know if the Monday open will be a bearish one. 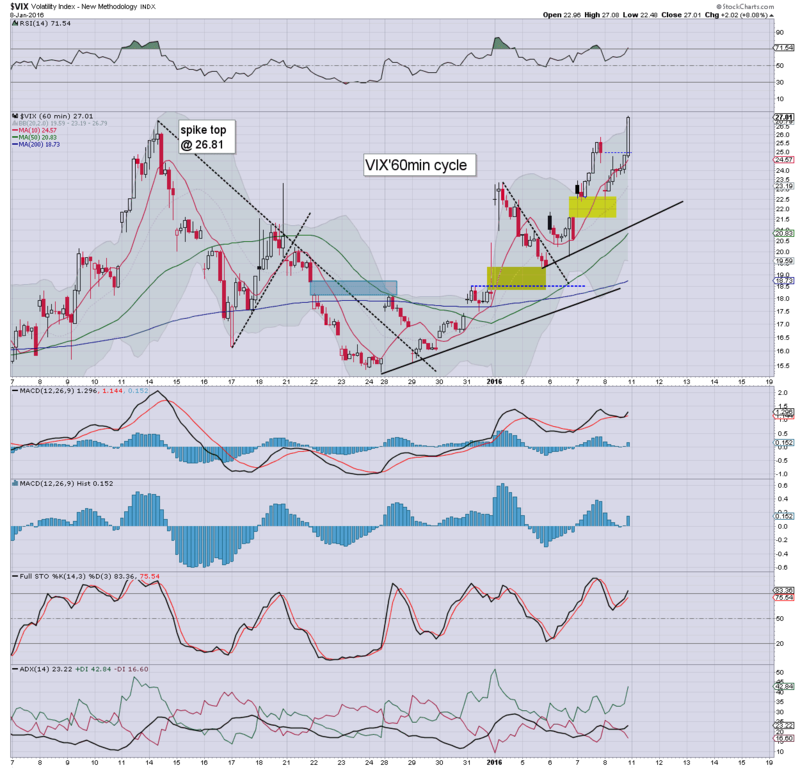 Doomer chat with Mr H.
China: +2.0% @ 3186... but that is a long way below the key 3400 threshold. 9.11am... Am kinda tired... will be taking things a bit lighter today. sp' jumps to +28pts... but we're currently already cooled back to +12pts. The issue remains... in what manner do we close... for the setup on Monday. It was just another day for the US equity market, with the third big daily decline of four days. 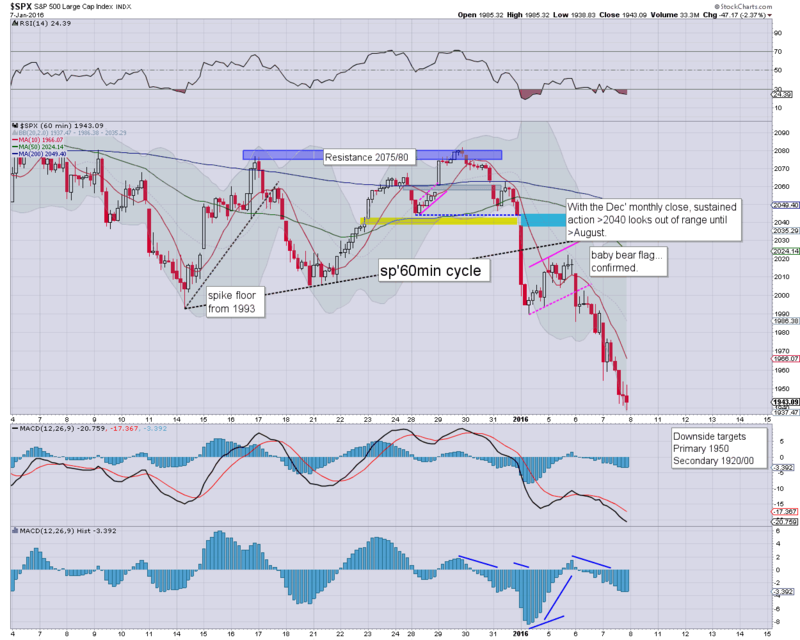 The sp'1920/00 zone looks a rather easy target. However, the 1700s are a viable target for next Monday, if the Friday close is at/near the low of the day. So, we're net lower on the week/year by a full 100pts (4.9%).. and there is currently ZERO sign of a floor. Indeed, from a weekly cycle perspective, a hit of the lower bollinger - currently @ 1903, would be a valid target for Friday/Monday. Any Friday close near the lower bol' will open the door to a fierce capitulation next Monday. 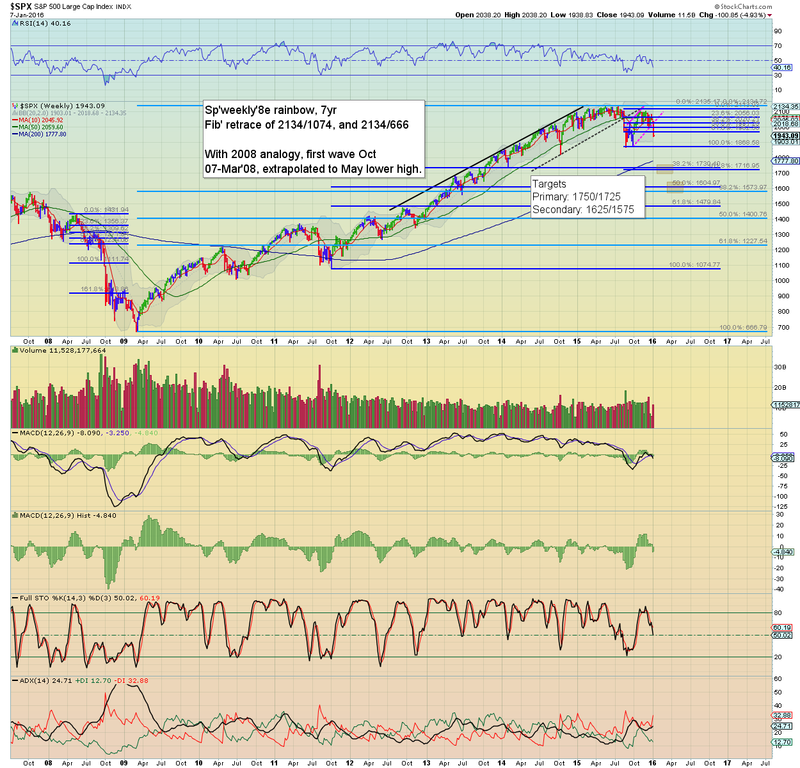 *There are a fair few fib' retraces/extrapolations on the following chart. I suggest you save it, and then view for better clarity. If you accept the bear flag from Aug-Dec'... then a 1.6x fib' extrapolation offers the low 1700s as a basic target. 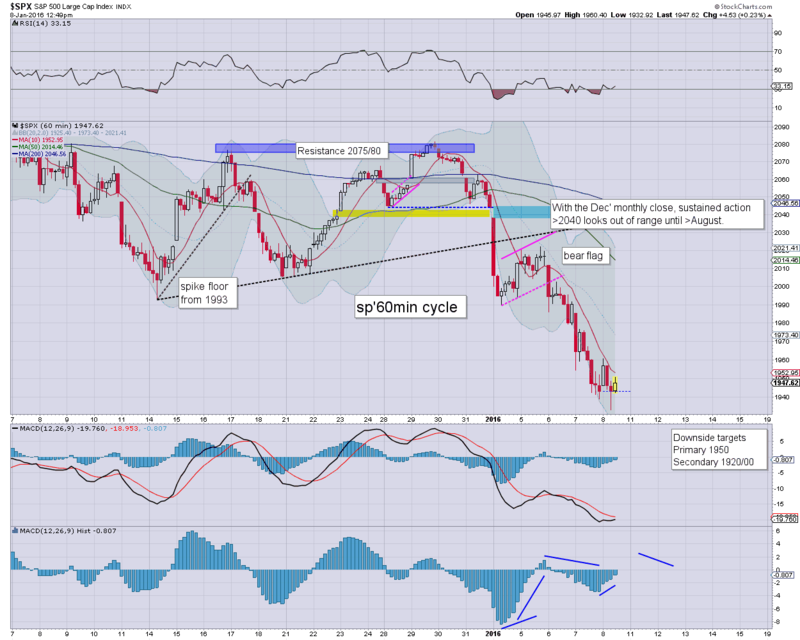 Whether the US/world markets are in the early phase of a 2008/09 collapse wave... impossible to say. I'd need to see a monthly close <1500 to have any serious consideration of that. Indeed, I hold to the outlook for 2016 I posted on Monday. Friday will see the monthly jobs data. Market is expecting 200k net gains, with a static jobless rate of 5.0%. Frankly, relative to the recent ADP jobs number, 200k should be exceeded. The issue is whether the market will see it as good news... or will dismiss it, in face of other concerns. Regardless of the exact Friday close, it has been a wild week. 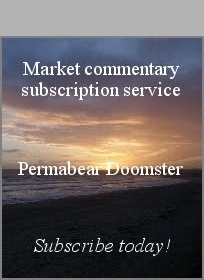 The mainstream has already become a little twitchy, with talk of no more rate hikes, and even some murmuring of QE4. What should be clear now... there can be high confidence in a mid term top, with much lower levels due in the days, weeks, and months ahead. As I noted at the weekend, the default trade is now to the short side... and other than a monthly close back above the monthly 10MA (currently, sp'2040s).. nothing will have me change that view. 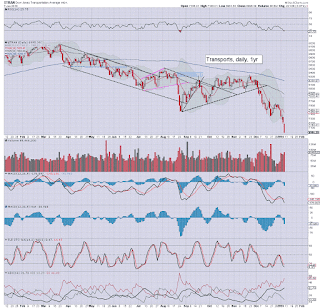 *the 'old leader' - Transports, saw a daily close under the 7K threshold, for the first time since Nov'2013. 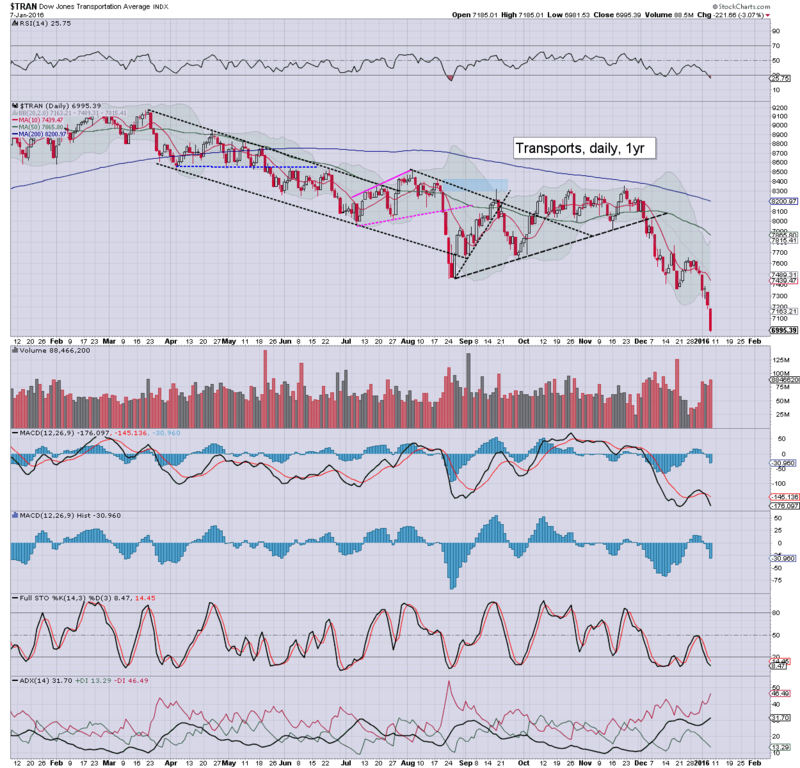 Next real support in the Trans' is the 5600/500 zone. After that... 5K. As for the sp'500.. it was also a very bearish close, below the gap zone of 1954/51. 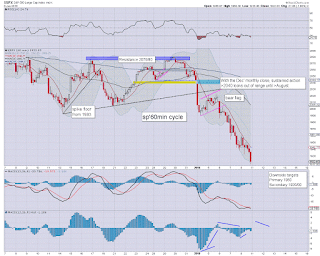 Next support - as suggest via the bigger weekly/monthly cycles, is the 1920/00 zone. 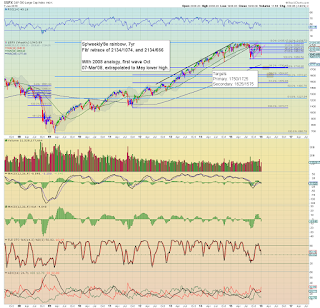 Any price action <1900 would be extremely suggestive of a brief mini-crash move to the mid 1700s.